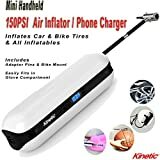 If you have a vehicle like a car, a motorcycle, a truck and even a bicycle, you need to have an air inflator with you all the time. Lack of proper air pressure on the tires is one of the many reasons for daily accidents. On top of that, the tires can get punctured anytime and at any place. Having a handheld tire inflator can help you to go to some distance where you can find a mechanics workshop. The handle inflators operate wirelessly in most of the cases and have a rechargeable battery installed. They have versatile applications, and we have listed the top 10 best handheld tire inflators in 2019 below. 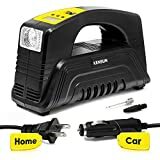 This is a very compact tire inflator that will fit perfectly in bottle holders, glove compartment, toolbox, or any such places in your bike or car. It can inflate the tires of your bike and car in a few minutes. There are different pins available so that you can use it with different inflatable objects. The tire inflator can be used as a power bank due to its inbuilt USB port. The LED screen shows the pressure and other parameters. You can use it as a bright LED flashlight in the dark. There is also auto shut-off feature to protect power. You get a bike mount, 8 different pins, Velcro strap, span attachment and a pouch. The handheld tire inflator is made up of stainless steel, and there is a built-in battery to power it. There is no need for connecting external cord. But you can also connect it to the cigarette lighter socket in your car using AC DC adapter and charge it or pump your tire. There are four different units available on the LCD screen. It takes 1.5 hours to charge it and a few minutes to inflate tires of bikes and cars. You can also use it as a flashlight, and it is super compact and lightweight. This electric tire inflator is powered by a battery, and the display screen shows the pressure in 3 different units. You can preset the tire pressure beforehand, and it will automatically stop and shut-off when the level is reached. Furthermore, there are LED lights which are bright and make everything visible in the dark. You can use it to inflate tires of cars, motorcycles, bicycles, trucks, air mattresses and other inflatable objects. This tire inflator has a massive battery for long-lasting service. The battery is rechargeable, and you can use it on almost any tires and inflatable objects. There are many accessories available which make it versatile. You get hoses, coupling, gloves, storage bag and much more. There is LCD screen which shows all the pressure readings in different units. The performance is excellent, and the durability is extremely high. It is easy to hold thanks to its pistol-like shape. 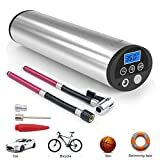 This digital tire inflator has a backlit LCD screen which makes reading in the dark easy and a large LED light which can be used as a flashlight. You can monitor the air pressure along with inflating any object. The inflator has a built-in battery, and you can charge its battery from the cigarette socket in your car. There are various unit conversions available for suitability. It takes 1.5 hours to charge the battery and 2-3 minutes to inflate tires completely. All the accessories are available in the package. 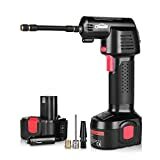 The air inflator is easy to grip due to its pistol-like shape, and there are AC and DC adapters provided for charging the battery from any power source. The gauge is easy to read, and the performance is high. It takes minimum time to fill up the tires and other inflatable objects. The storage is not a problem due to its compact design. This is an extremely compact air inflator, and it is made p of stainless steel for durability. It operates wirelessly due to its inbuilt battery, and it also supports AC DC adapter for fast charging. 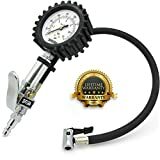 There is a digital pressure gauge, and you can preset the pressure for inflating your tire so that it automatically shuts off when the point is reached. All inflatable items are compatible with it by using various pins. There are LED lights for working with it at night, and the company offers one year warranty. 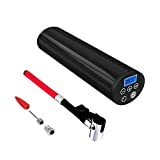 This mini tire inflator comes with rechargeable battery to operate wirelessly. There are AC and DC chargers provided in the package. The performance is on the higher side, and it merely takes a couple of minutes to fill it up. You can set the desired air pressure, and it will shut off automatically when the point is reached. There are LED lights for visible in the dark, and the gauge shows pressure in four different units. All the accessories are available in the package. This is the most compact air inflator you will ever home. It is made up of steel and brass and therefore, it is extremely sturdy and durable. The product has international accuracy standard, and you can make it operate hands-free. It is one of the most used tire inflators by the mechanics. You can inflate bicycles, motorcycles, cars, SUVs, and trucks. The company offers a lifetime warranty on the product. This is the best-rated handheld tire inflator with extremely sturdy construction. The brand Kensun is very reputed for their quality products. The inflator has an ergonomic handle which makes it easy to hold on to for a long time. It has compatibility with AC wall socket as well as DC cigarette lighter socket. All the different nozzles attachments are available so that you can use it on different objects seamlessly. There are LED lights and large LCD display with unit conversion. Most importantly, it can function during extreme temperature without any jamming. 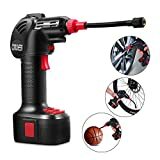 Having a handheld tire inflator is a must thing if you have a vehicle. You can inflate the tires on the go as the handheld tire inflators operate wirelessly. You can use them on any vehicle by using different pins or nozzle attachments. There are LED lights available to work in the dark, and the gauge meter shows different units. 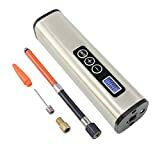 If you want a real value for money product, then buy that tire inflator that lets you set the air pressure and shuts off automatically.